This is a bittersweet time for me. 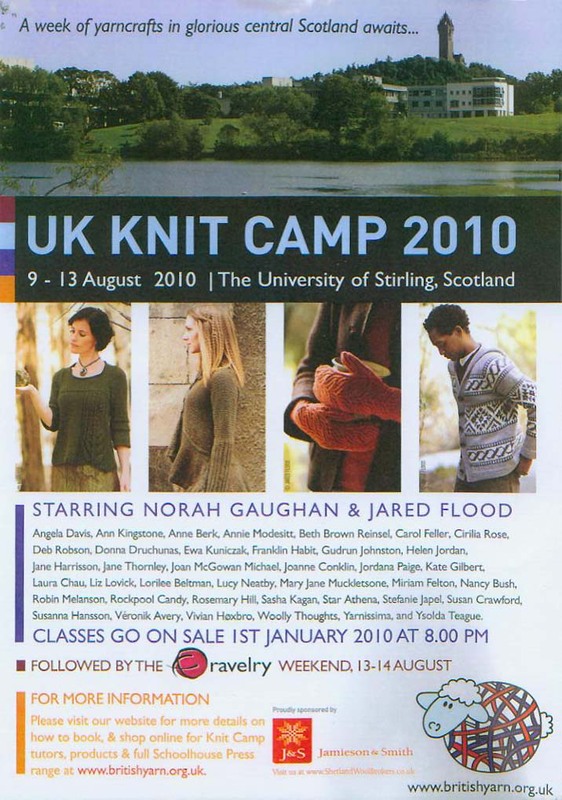 On one hand, I was to have been preparing to fly to Scotland to teach at Knit Camp 2010. I have this ad from Yarn Forward, a British knitting magazine, as a souvenir. My name is in the third row. This would have been an amazing time, but I had to withdraw to take care of some family business. There are only so many vacation days from work, and I have my priorities. Knit Camp 2010 was to be followed by the I Knit London Weekender in September. I recently found out that one of the teachers who will be there is Alice Starmore herself. Oh well. All that being said, now comes the sweet. I am preparing for a trip home to Canada. I'm spending the majority of my time in Kingston with my Mom. The bonus good news is that my daughter, son-in-law and 6-month-old grandson, Braydon, will be flying in from Calgary, so I'll get to see them, too. I'm really looking forward to that. Perhaps I can go to Scotland and London another time. I'm also planning to go to the Kitchener Blues Festival. Bonus here, too. One of my favorite bands, Delta Moon, from Atlanta, will be performing. I haven't seen them in person for two years. My hotel is right in the heart of the festival, and near a yarn shop. Good planning, don't you think? The hard part of a trip is deciding what knitting to take along. I can't just take one project for 10 days, for heaven's sake. I'm in the process of narrowing down my choices. I'm thinking I might work on the Saroyan scarf. I have the yarn I want to use for it: Wolle's Tropical yarn, that I talked about before, here. I'm also going to take some of my Rowan purelife British Sheep Breeds DK Undyed wool to continue swatching for an aran sweater I'm designing for someone. I need to have it finished by early October. More on this project and my trip to Southern California later. So sorry Europe didn't work out for you, but it sounds like Plan B is going to be pretty nice. I'm thinking about a Saroyan too. Maybe with a little cashmere. Wow, that is hard to have to choose between the two. My family are in the Kitchener area of Canada too -- if you are staying in K-W, you won't be far from "Shall We knit" in New Hamburg -- definitely worth a visit if you have time. There's a great tea shop that just opened up around the corner from it too. Enjoy your time with family and think about all the knitting you'll get done!